In my spare time (most of my time these days) I decided to re-do the guest bedroom curtains to go with the white linens. I found these great pillow cases at Wal-Mart and turned them into a cute valance for the guest room. Last night we went to the Whitaker Music Festival with another couple from seminary. 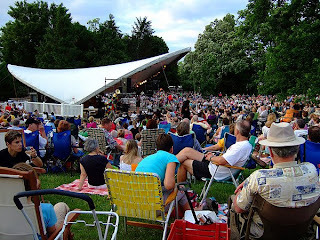 This is a free music festival held in the Missouri Botanical Gardens most Wednesday nights in the summer. 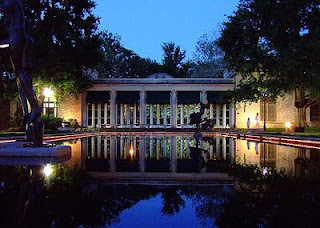 The gardens are free anytime after 5 and the concert goes from 7:30-10. Marty and I arrived about 7 with our two beach chairs and a picnic basket filled with yummy snacks- grapes, cheese, wine and pretzels. When we arrived, people were everywhere enjoying their picnics. Some people had normal picnic materials like we did, yet some were enjoying a full dinner spread on portable tables and chairs, they even had candles lit on their tables for when it got dark. It seemed like there was a big group of people that did this every Wednesday in the summer. It was a really fun evening with friends, listening to live music, enjoying good food and company. We will definitely attend the music festival next week for their last week of the summer. 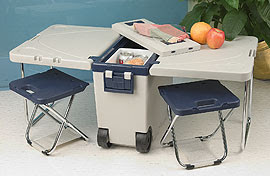 We did not see this cooler contraption, yet it would be nice way to picnic in style! Wahoo! Marty completed and passed Greek 301, the first summer session. He came out of the class with a B or B+ (we aren't sure yet), which we were both very proud of. In this class, he learned the basics to the Greek language. You know Zeta Tau Alpha, and Tri Delta... HA. The alphabet is totally different, so he had to learn a brand new character system. He memorized lots of vocabulary, and learned the rules of their grammar. Last Monday, he began NT Greek 302, where he is translating all of 1 John. Every class he has a quiz on vocabulary and homework to translate a part of 1 John. He is enjoying putting what he learned in greek 301 into practice. I am still looking for a job. I had a good interview on Friday, so I will keep you posted on the results of that. I have various resumes out there floating around in internet la-la-land. We will see if I hear back from any of them. We continue to work at making new friends, and being patient with that as well. We had our first BLT of the season tonight for dinner (YUM) and are enjoying spending A LOT of time together, which we haven't had the luxury of doing the past few years. 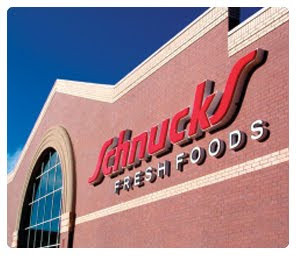 Schnucks- One may think Schnucks is a term of endearment or a nickname to call a spouse. Example- "Hey Schnucks, will you pass me the salt please?" or "Welcome home Schnucks, I missed you!" Don't be mistaken, Schnucks is now where to do some of our grocery shopping (when there are good sales). It is similar to Harris Teeter if you are in Virginia or Wegmans if you are in Chester County. FYI- Missouri grocery stores carry wine and beer like VA, yet they also carry liquor. 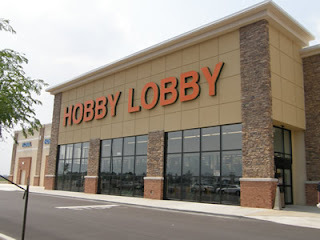 Hobby Lobby- This is one of my favorite new finds in St. Louis. I have heard of this store before, yet have never lived close to one. They carry excellently priced fabrics and every sort of decorating and/or craft item you could want. I literally spent 1 1/2 hours in this store today and only spent $3.15 on fabric. Although it is July, they have fall, winter and spring holiday decorations and decor. I know I will spent a lot of time there within the next three years. I have an interview at a new charter school in St. Louis on Friday at 3. Please pray for that interview that I would know if it is a good fit for me, and that I would communicate clearly. 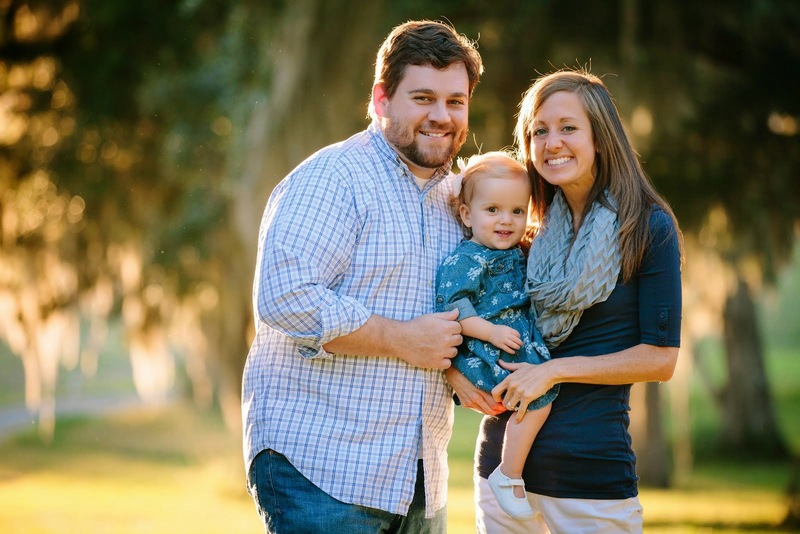 I heard about this position from a new seminary student's wife who just got a job there. She sounded excited about the position, yet it seems like a lot of work starting a new charter school and the expectations that come along with that. I am hoping to get a clear understanding of the job expectations on Friday, and hopefully it will turn out to be a good fit! I am excited to at least have some communicate with a potential employer! Please pray for a job for me. It is not a good time for teachers to be looking for teaching positions. There are virtually no teaching jobs out there, and most that I have applied for are teaching assistant positions. This is very humbling process when you have a Masters degree at 3 years of experience. 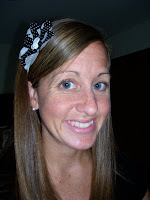 I hope to get a teacher assistant position in a school district with hopes of getting a classroom the following year. I do not want to have to look at Daycares, yet that may be the next step at the end of the month. Pray for patience and wisdom during this search. Marty has the week off of class, so we have discovered some fun things to do in St. Louis. There is a HUGE farmers market downtown called Soulard's Farmers Market. We have enjoyed getting some fresh produce there and beautiful flowers. Today we went to the zoo with some new friends from Covenant and their children. It had all of your typical zoo animals and some nice exhibits. Best of all it was free, so we can visit the lions, tigers and bears anytime we want! You can see the antelope, leopards, lions and the Somali Wild Asses! In our spare time we also discovered how to video chat on gmail with Stacy. Miss you and love you Stace-Face! Here is a quick tutorial on how we made the headboard. There are lots of sites out there with great advice too. We just kind of went with what we had and could find in stores around here, so there are some modifications. Step 1- Find your fabric- I loved a lot of fabrics we found at fabric stores, yet the price of nice fabric was not in our budget. 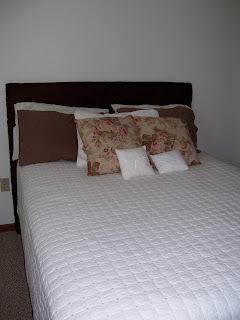 We thought about getting a sheet set and using the flat sheet as our fabric, yet most nice sheet sets were around $40.00. We ended up finding a tablecloth at Home Goods for $10.00 that was the color we wanted and has a subtle paisley pattern. I purchased 2, one for the headboard and one to make curtains with. Step 2- Buy your plywood- Most plywood in the store is 4 feet wide, so the height of our headboard is 4 feet. We measured the width of our queen mattress, which was 60 inches, and added two inches to the headboard width. We asked the helpful Home Depot man to cut our plywood at 62 inches. You can use 1/4 inch or 1/2 inch plywood depending on your budget and/or preference. Step 3- Buy batting and foam- I went to Hancock Fabrics to get my batting and foam because foam was on sale. You can go to most craft stores for batting, yet the foam was harder to find. I got 2 two inch foam pieces, to fit our 48'' by 62'' headboard. FYI- Foam was much more expensive than I thought. 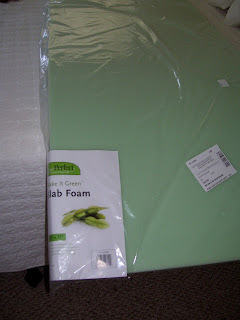 I got each piece of foam for around $20.00, yet full price would have been $44.00. The foam is worth doing, but just look for sales before you start this project. Step 4- Cut your foam to fit the dimensions of your plywood. I used an utility knife to cut, yet it took a couple cuts to get through all the foam. It does not need to be perfect, because it will be covered with batting and fabric. Step 5- Assembly- Iron fabric/tablecloth and lay it flat on the floor ( front side facing the floor). Lay the batting down next on top of the fabric. Then place the foam on top of the batting. Last, lay the plywood on top of the foam. 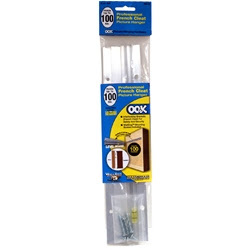 Stapling- Use a staple gun to secure the layers to the back of the plywood. I started with one staple in the middle of the top and bottom edges. Then did one staple in the middle of the left and right edges. Then I stapled about every 2 inches all the way around. The corners you have to play with to see the look you like. I cut out some extra batting from the corner and folded the extra fabric like hospital corners with sheets. This gave the corners a more flat look. That beats the $499.00 +$75.00(S&H) Pottery Barn Price. 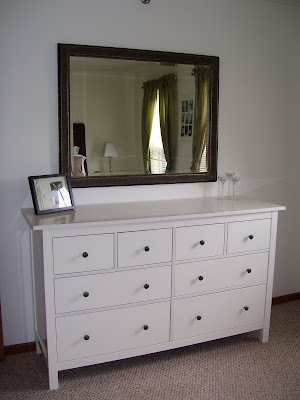 Any advice for finding cheap dressers and linens? 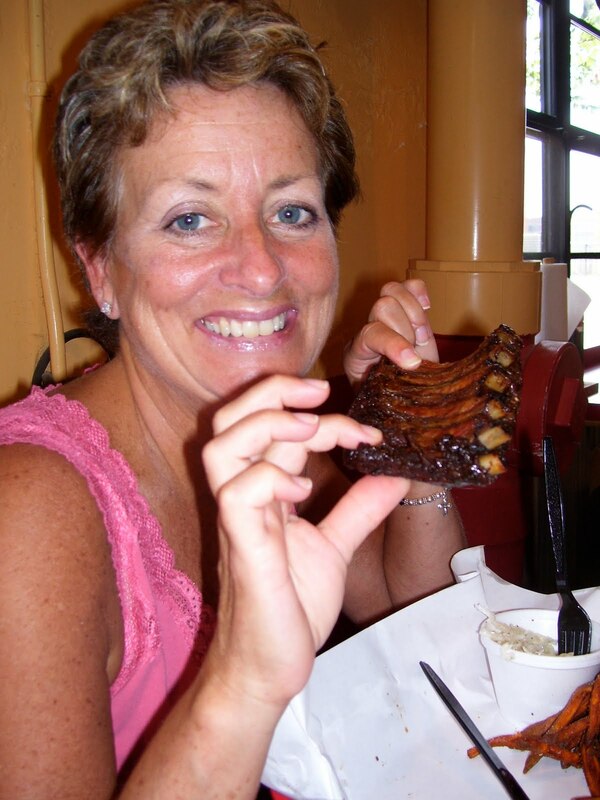 Barbecue is an important food in the Cates household, so it was only necessary to check out the best St. Louis had to offer immediately after moving here. We were told to try Pappy's, and it definitely did not disappoint. Ribs are the St. Louis style of barbecue, yet I don't really do meat on the bone, so I opted for the pulled pork sandwich and sweet potato fries on the side...yum! Mom and Marty enjoyed the ribs though, and Marty didn't speak the entire meal which proves how good the ribs were. If you ever get a chance to visit St. Louis and want some good food, Pappy's would be a great place to visit. Beware- you may have to stand in a very long line, but it is worth it!